A variety of uterine manipulators are available and useful in positioning the uterus during laparoscopy. Many of these manipulators also allow the operator to instill an inert colored solution (such as sterile saline with indigo carmine dye) into the uterine cavity to determine whether the fluid can be seen passing through the fallopian tubes into the pelvis. The Cohen cannula is rigid and usually allows excellent control of the uterine position. 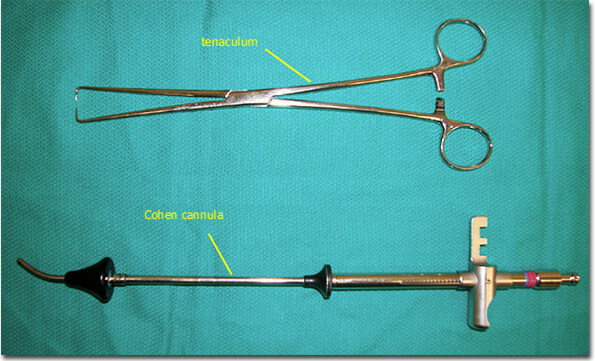 The cannula is hollow to allow for instillation of a dyed fluid into the uterus. Generally, the anterior lip of the cervix is grasped with a single tooth tenaculum, the Cohen cannula is applied to the cervix (the acorn tip is wedged against the external os [opening] of the cervix), the Cohen cannula attaches to a finger hole on the tenaculum using a spring loaded metal connector (here in the shape of an “E”), and a syringe containing blue dyed fluid can be screwed onto the end of the cannula.